One of my favorite things about The Bazillions is the skillful way they teach grammar and writing on their albums. This outing, it’s the “Wide Open World of Adjectives” and the writing rules of “Who What Where When Why.” The latter could easily be incorporated into language arts lessons on how to write a paragraph or as a story starter. The empowering messages of “You Could Be the One” (you can grow up to be anything you want), “That’s My Style” (you do your thing and I’ll do mine, and that’s cool) and “More To Be Done” (I’m learning and growing and together we can make change happen) are so important in today’s world of social media bullying and would work well as conversation starters both in the classroom and at home. 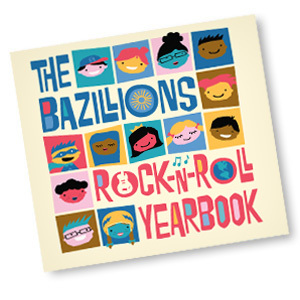 This delightful album will be a great addition to classroom lessons as well as family rockin’ out times.